Despite resort properties being a relatively new addition to the Vietnamese real estate landscape, several high-end projects in this segment have recently taken shape targeting an elite customer group that is financially wealthy and highly demanding. Nguyen Khanh Duy, residential sales director at foreign-backed real estate consultancy firm Savills Vietnam, believes that after a time of quiet but stable development, the high-end and luxury real estate segment is showing signs of accelerating growth, fuelled by rapid economic growth, rising disposable incomes among customers, and most importantly, limited supply. Duy said that while the development of several luxury projects with prices ranging from $5,000 to $10,000 per square metre that are about to be launched may not seem like an option for the majority of customers, there is reason for optimism. “We find that there is significant attention paid by an increasing number of customers in the luxury segment since early this year,” Duy said. Another reason global investors keep flocking to Vietnam, according to the real estate expert, is the attractive return on investment (ROI) ratio, depending on each project. The modest supply has also spurred liquidity and resulted in the segment’s two-digit annual growth rate. In fact, many developers have been concentrating on developing high-end projects in recent years, and their efforts have been fruitful. With respect to resort properties, despite the products’ somewhat belated emergence in the market, several high-end products have recently taken shape, targeting the more discerning elite customers with sound financial strength. The Costa Nha Trang is an eminent example by virtue of its golden position and five-star service quality, promising to bring unparalleled experiences to prospective buyers in the beautiful coastal city of Nha Trang on Vietnam’s south central coast. 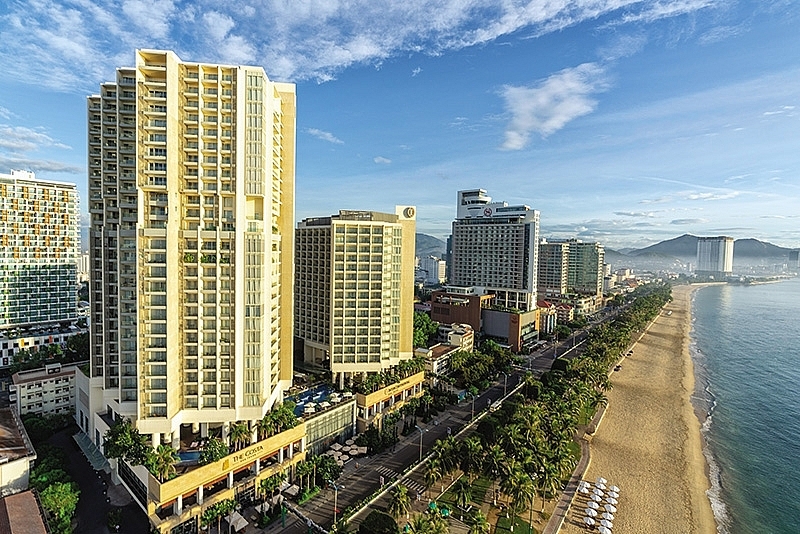 Nestled on more than 12,000sq.m in Nha Trang’s central business district (CBD), The Costa Nha Trang overlooks a gorgeous beach and provides convenient access to major roads as well as famous tourism sites in the area, such as Long Son Pagoda, Ponagar Cham Towers Complex, Ponagar Mineral Spring, and Bao Dai Palace. The recently inaugurated international terminal at Cam Ranh International Airport is expected to ramp up the coastal city’s appeal to visitors, particularly the affluent coming from developed areas such as South Korea, Japan, and Europe. The demand for luxury real estate has also been rising, creating a niche that is still absent in Nha Trang. This explains why the launching of the second round of sales at The Costa Nha Trang is a golden opportunity to cash in on the growing wave of high-income international visitors anticipated to arrive at the coastal city in the near future. The 29-floor tower, featuring low construction density with all apartments overlooking the jade ocean, is part of a mixed-use development designed by renowned Singaporean architect Tan Hock Beng. In parallel with perfect five-star concierge services, The Costa Nha Trang offers prospective buyers breathtaking individual private space, 24/7 security, a stunning private beach, and an individual elevator system with magnetic card access to each floor. The tenants and customers of The Costa Nha Trang will also have access to upscale facilities provided by the nearby five-star InterContinental Nha Trang Hotel, such as a Japanese-style spa and a gourmet food court at the foot of the building with a raft of well-known restaurants such as Ruman café, Terace café, Costa restaurant with chefs from Hong Kong, and delicious dishes featuring the highest quality seafood from the surrounding sea. The Costa Nha Trang has completed its legal setup and prospective buyers can be at ease as each apartment comes with a pink book proving ownership. This unique property will be operated and managed by the developer and owner of InterContinental Nha Trang and management firm Colliers. Part of the five-star Intercontinental Nha Trang complex, The Costa Nha Trang is anticipated to become the top choice for holiday-makers, with a high and steady customer volume promising stable revenue and profitability. Last but not least, The Costa Nha Trang is the latest five-star tourism residence in Nha Trang’s CBD that offers a competitive pricing factor, with a limited supply for customers.